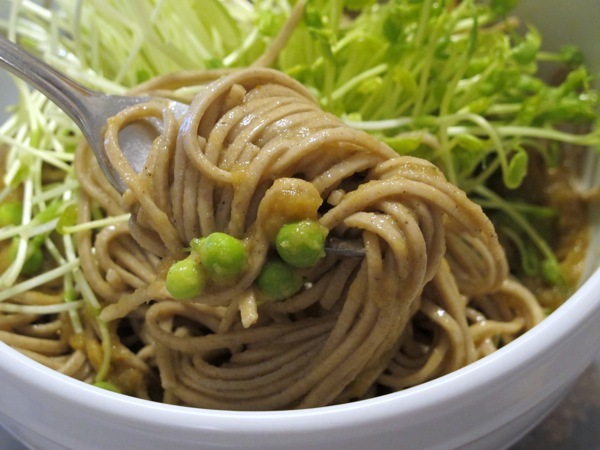 Recipe: Buckwheat Soba with Freshly Shelled Peas and a Zucchini Miso Dressing (Vegan) | Save. Spend. Splurge. Just the other day, I came up with a recipe on the fly. I had seen some peas still in their pods ready to be shelled, and remembered on an episode of Top Chef how Jacques Pepin just LOVED freshly shelled peas (and Carla was to cook his “Last Meal” with them). 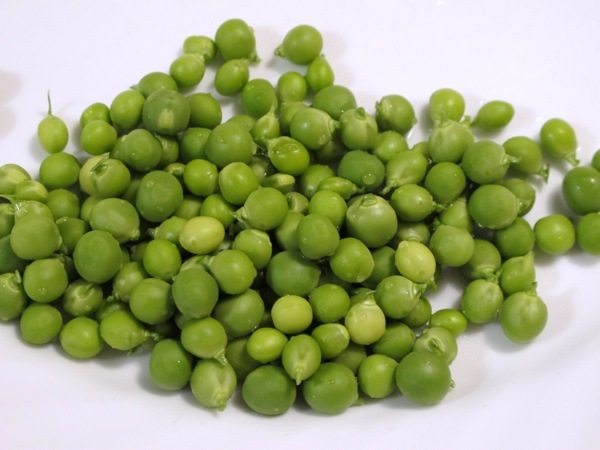 Not ever having had freshly shelled peas in my life, I bought a small bunch out of curiousity. Then I walked by the lettuce and saw pea shoots, and figured it was a match made in heaven. But …what do you eat!? I sympathize because I said the same thing not too long ago. I couldn’t figure out a meal plan to save my life that did not include meat, seafood, eggs, or dairy products. As the months have passed, I just realized it was a matter of thinking differently. Imagine that these products didn’t exist, and make a creative meal accordingly. It is a LOT easier and faster to cook with meat and eggs to make a meal, than it is to look at some vegetables and come up with a dish. I am forced to be more creative, and came up with this dish. Lately, I have been pureeing zucchinis into my Green Smoothies to drink (you don’t even taste them), but I remember a long time ago I made a Zucchini Hummus on the fly (mixed with Chickpeas) and rather liked the result. This is how I created the Zucchini Miso dressing! Side Note: It’s best to eat miso paste raw if possible. When you cook it, you kill the good enzymes and all the benefits to eating miso in the first place. Throw it all in a blender or food processor and puree it; I use an immersion blender. Then I thought: Okay, so let’s shell the peas. I shelled them, took a taste and loved how they were raw, as is. I kept them raw. I didn’t even cook them. Shelled them, and rinsed them. Then I wondered if I needed something hot and comforting like rice or noodles, and decided to pour it all over buckwheat noodles, which gave me this recipe. I cooked the buckwheat noodles in boiling water for 4 minutes, and then drained them. You can add soy sauce to taste. I added so little miso in the dressing (afraid of salt), that I needed just a splash of soy sauce to bring it all together. 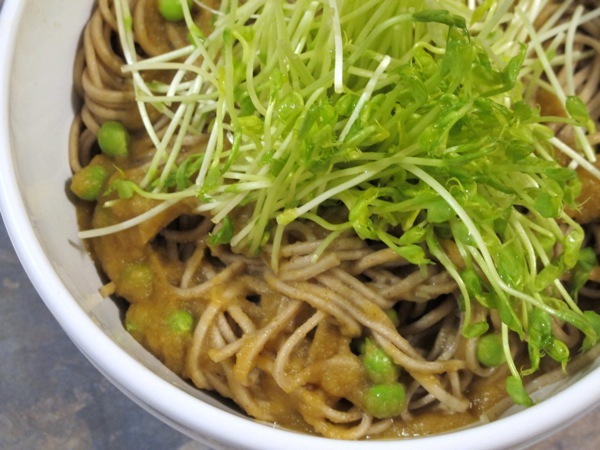 The peas give a nice, sweet crunch, the pea sprouts are another fresh addition to something so warm and comforting like soba noodles, and best of all, it took me only 15 minutes to prepare in total, preparation and cooking time included! ← Investing Series: What does market capitalization (market cap) really mean? Our first experience with miso was a few years ago in South Padre Island at a place called Uchi. It was soup and had such an incredible flavor. Anyhow, the other ingredients look equally enticing and healthy as heck. This recipe is may have a go at Hoombah House. Thank you, Mo! You’re welcome! Eat it in good health, but be careful of the salt content in miso. The zucchini was just because I felt like eating it. As for your feeling a lack of energy, did you take B12 supplements? If you don’t, you will feel very fatigued and nauseous. You can read a post I did on going vegan 99% here. This looks SO good… I also love the vibrant colours. It WAS good 🙂 Surprisingly. Mochimac, this sounds so yummy! I like how you suggest pretending that certain products do not exist and create a recipe accordingly. Zucchini is making a comeback over at our house, and I’m now thinking about variations on the hummus. Thank you!